Pit Surf Shop – a long-time participating I Ride I Recycle retailer in St. Augustine, FL – just wrapped up their annual I Ride I Recycle deck recycling contest and collected over 60 broken boards to be saved from landfills. The contest, which is held every December, gives Pit Surf customers a chance to haul in their broken boards for a chance to win a brand new complete, courtesy of Art of Board. 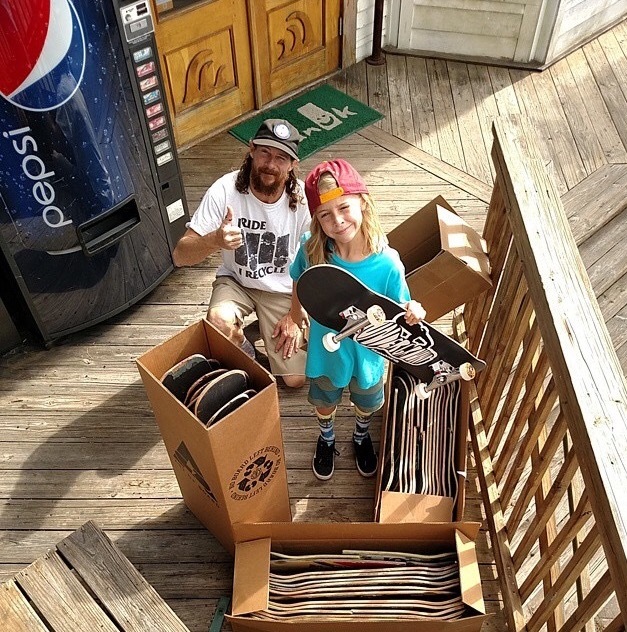 This year’s winner was a boy named Skylar who donated 26 decks to the cause. All boards will be repurposed by Art of Board in the form of tile surfacing. Big thanks to Pit Surf Shop manager, Bodie Walker for his dedication to skateboarding, his community and to helping us clean up our planet and do positive things in the process! If your shop would like to rally the community and host one of our contests, just contact us and we’ll get it rolling. It’s a great way to bring customers in the door, put cash in your register and do something for the greater good.